One of the real tests of a tabletop game isn’t always about gauging the number of players enjoying it at once or the length of time they’re engrossed in it. I learned this recently when I got my hands on Black Table Games’ new card battler Wreck-A-Mecha, failing to find friends who were home to join me. I had a night free, and had already played the game a few times with others over the prior week, but no one was available to that evening. So, I did the only logical thing I could think of: I played against myself. And unsurprisingly I had a blast. As a testament to its design, Wreck-A-Mecha plays well no matter how many people are at the opposite sides of the table. 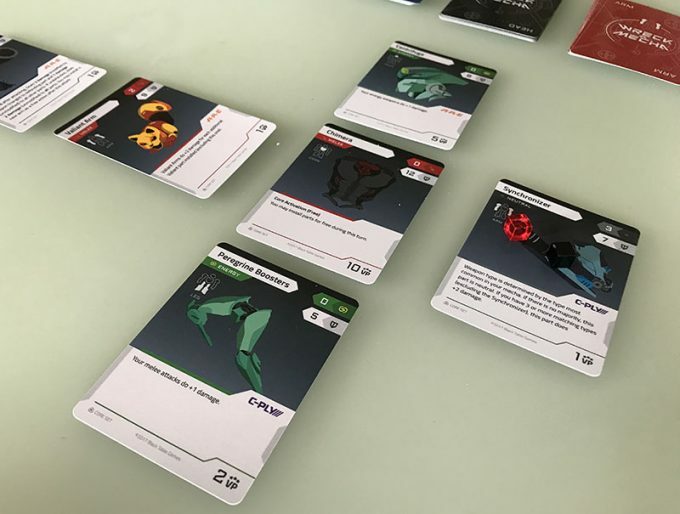 Sci-Fi tabletop gaming isn’t a new concept, so it takes a decent premise to make one stick. Designed for two, WAM pits players against each other in an effort to build giant mechs and battle until only one bot survives. It feels like a mix of Voltron and Pacific Rim. 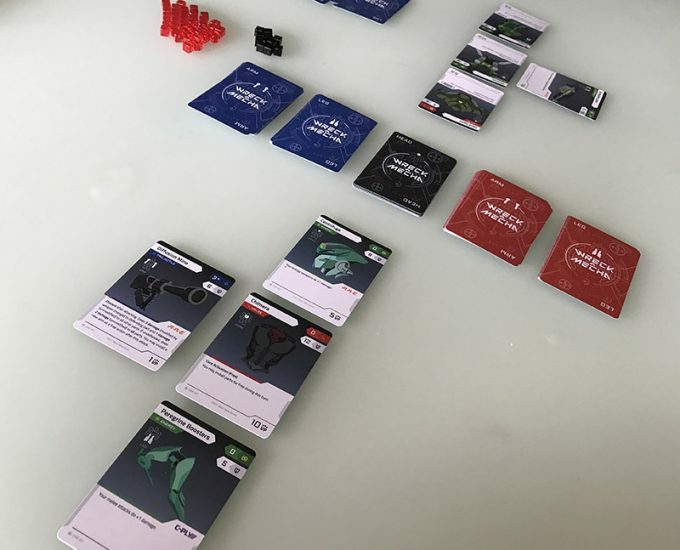 The robots are built and the game progresses as players take turns selecting parts, attacking and defending, chipping away at the defense or setting up a solid wall themselves. The game asks us to rack up 10 points by defeating limbs or going right for the opponent’s robot core. With a few ways to win, the matches can take as little as 10 minutes or as long at 30 with determined competitors. A further modifier is to go all in on the game’s paper-rock-scissors aspect, with more or less damage depending on where a part falls on the triangle. The strategic aspect of the game sets it apart. With a limited deck, throwing cards at our mech to bolster it isn’t as important as understanding which parts will attack and which will defend during a turn. The parts each have defensive and offensive stats, so balancing between which ones ones will do what is key. It’s not uncommon to fall behind in point totals, thinking that we need to set every almost part to defend on our next turn. In reality, this is perhaps the best time to be aggressive as the enemy bot might be prepping for their own battle instead of defending. But those are the crucial moments when Wreck-A-Mecha shifts from robot building to tactical maneuvering. The variety of components is strong, with different balanced levels of offense and defence and special skills to modify their effects. The only hindrance is that the randomness of a draw can result in a couple of turns that leave us at a disadvantage. It never lasts for more than a round or two, but that could be enough to force us into tense moments. The art on the cards themselves is nicely executed, with groups of similar components all visually matching and bursting with color and Tron-like light. I can imagine the sound effects of the metal clanging on itself. It’s limited in amount of cards at the moment, but potentially great for expansions in the future. Wreck-A-Mecha is a novel concept, with accessible gameplay that is easy to learn and quick to get accustomed to. The game is designed to follow its specific rules or let us break them and make our own. It flows extremely well, and can become a deep game very quickly if the players are even slightly experienced. Playing alone let me experience one thing, at least: I managed to build not one but two incredible mechs, resulting in a face-off that would have put any anime to shame. 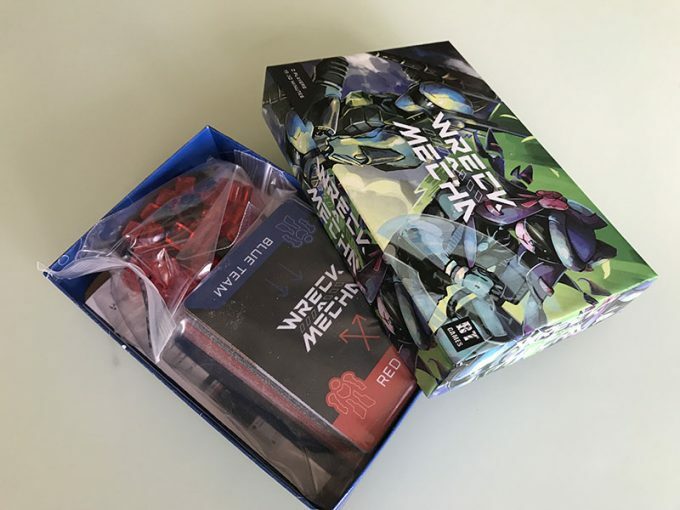 Wreck-A-Mecha is available on Kickstarter right now through to July 2. This review is based on a box set of the game sent to SideQuesting by the publisher. One of the game’s creators, Jesse Gregory, has written pieces for SideQuesting in the past.